Nullodor crystal silica litter is a new generation of litter granules for small pets. The micro-pored crystals absorb liquids very quickly and effectively so your pet will always have a pleasant, dry tray. 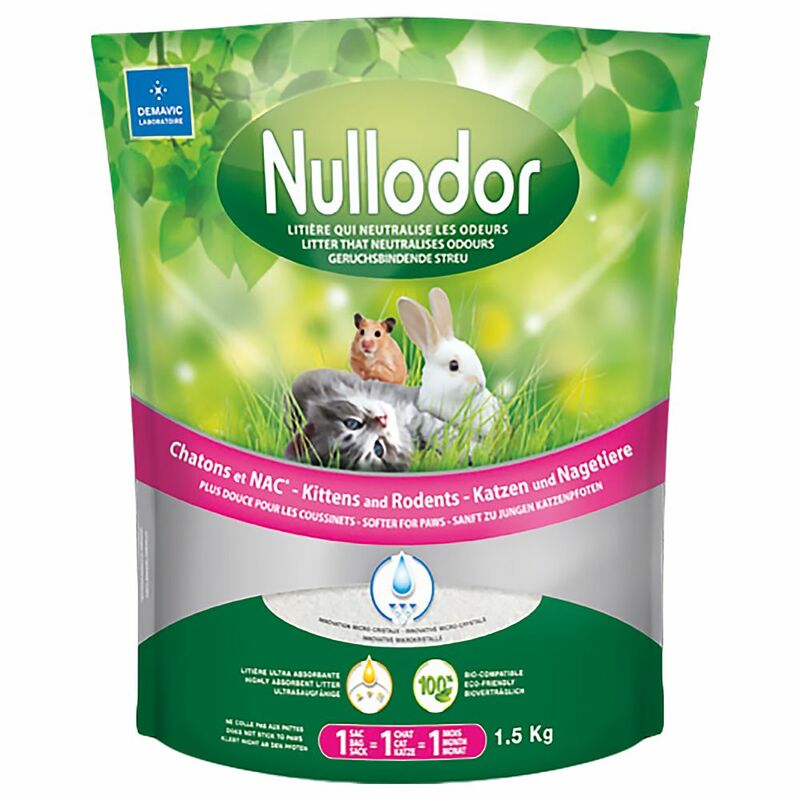 Nullodor is ideal for kittens, ferrets, rabbits and other small pets. Benefits of Nullodor Silica Litter: Economical: 1 cat = 1 bag = 1 month Extremely absorbent, over 150% Natural product Zero odour Antistatic – does not stick to paws Proven antibacterial effect* Non-toxic * The following strains of bacteria were monitored for 26 days: Escherichia coli (E.
coli), Pseudomonas aeruginosa, Staphylococcus aureus. The Nullodor Technology Nullodor is a natural product made from extremely pure silica gel and water which is heated at a high temperature under low preΒure for a week. The slow evaporation of the water causes micro-pores and micro-capillaries to form, enabling each tiny silica crystal to instantly absorb all moisture away from the surface. Each silica crystal has an absorption rate of 150%. Liquids are absorbed in a fraction of a second, and the water then evaporates leaving dry litter which can be re-used over a long period of time. Nullodor completely absorbs and locks away odours for 4 weeks. The nasty smells are absorbed with the liquids but whereas the liquid evaporates, the odours are trapped in the centre of the silica granules. No ammonia can escape. Two methods of use are poΒible for rodents: Litter only: – use as for cats and kittens As an underlayer: Spread a fine layer of Nullodor on the bottom of your pet's litter tray or cage and cover this with the bedding material (wood shaving, plant fibre bedding) you normally use. The resulting mix will remain dry and odour-free for several weeks. When you notice an odour it is time to remove both the litter layer and the top layer of bedding material and to put down fresh layers. Price just £4.59! Click here to buy now!